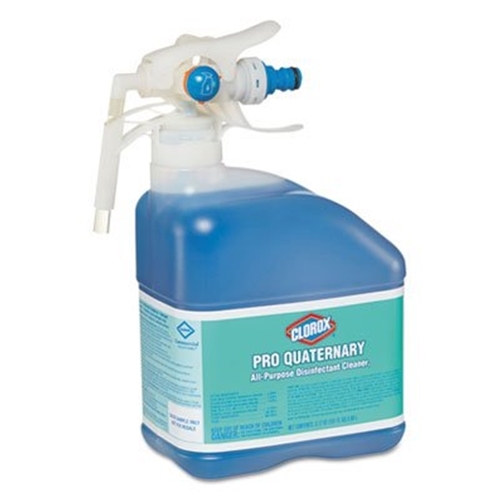 Clorox Pro Quaternary All Purpose Disinfectant Cleaner from HealthyKin.com is a non-bleach broad-spectrum disinfecting cleaner. It is EPA-registered to kill both MRSA and CA-MRSA on a wide variety of surfaces. The pH-neutral, bleach-free formula provides efficacious cleaning performance on floor and bathroom soils, and leaves a clean, fresh fragrance. Effectively clean and disinfect a wide variety of surfaces – such as floors, stainless steel, sealed granite, glazed ceramic tiles, shower stalls, and plastic and metal surfaces. The quaternary (bleach-free) formula is also EPA-registered for unique, high-risk surfaces such as sports equipment, exercise/wrestling mats, whirlpools and outdoor play equipment. Great cleaning solution! Gets the job done, safe and easy to assemble and use.